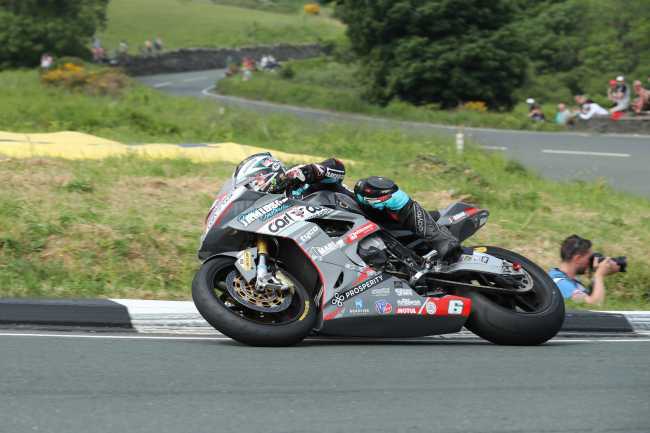 Peter Hickman (Smiths Racing BMW) claimed his first victory at the Isle of Man TT Races, fuelled by Monster Energy, when he took a sensational RL360 Superstock race by 4.4s from Michael Dunlop (MD Racing BMW) with Dean Harrison (Silicone Engineering Kawasaki) in third. The race saw the top three swap positions from the throughout the race but a stunning new lap record of 134.403mph on his final lap, just outside Harrison’s outright lap record from Saturday’s RST Superbike race, enabled the Burton upon Trent rider to come home in a new race record some 58.7s quicker than the old mark. Harrison led Dunlop by three and a half seconds through Glen Helen on the first lap with Johnson in third and Rutter, Hillier and David Johnson completing the top six. But it had been a slow start to the race for Hickman who was down in an unfamiliar tenth spot after running straight on at Braddan Bridge with newcomer Davey Todd flying in ninth place. By Ballaugh, Harrison had extended his lead to 4.4s and through Ramsey for the first time it had crept up again to 4.8s. Hickman had got going and had jumped up to third, six seconds behind Dunlop and 3.5s ahead of Rutter. Gary Johnson was in fifth and Conor Cummins in sixth as just two seconds covered fourth to eighth placed Hillier who had dropped to the back of the group. 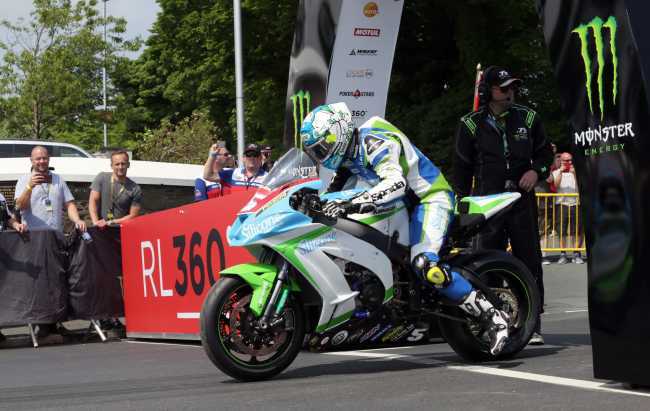 An opening lap of 133.073mph was just a whisker outside Ian Hutchinson’s lap record from 2016 for the class and he was now 4.3s ahead of Dunlop with Hickman only a further 3.3s behind in third. The gap to Rutter was bigger, at 12.8s, with Cummins, David Johnson, Hillier and Gary Johnson now the running order as Todd completed the lap in a brilliant ninth place after a lap of 127.625mph. As they got to Glen Helen, Harrison’s lead was up to 5.7s as Hickman closed to within 1.4s of Dunlop and by Ballaugh, he’d nosed ahead of the Ballymoney rider by 0.8s. The race was all about these three riders as Rutter was now over 22s adrift in fourth. Through Ramsey Hairpin, Hickman had cut Harrison’s lead to 2.4s with Dunlop only 2.2s back in third. Rutter was still in fourth but his advantage over David Johnson was a slender 1.5s with Hillier only 0.8s behind the Australian. There was disappointment for Cummins though as he retired. At the head of the field, Hickman was really pressing on and a sensational lap of 134.077mph saw him arrive at his pit stop with a 1.2s lead over Harrison with Dunlop only 1.8s behind in third, just three seconds covering the trio. David Johnson had moved up to fourth ahead of Rutter and Hillier but it was extremely tight as just one second separated the three riders. Meanwhile, Todd became the second fastest newcomer ever with his lap 127.890mph moving him up to an unbelievable seventh place. The pit stops shuffled the order with Dunlop hitting the front for the first time at Glen Helen on lap three, his lead over Harrison half a second with Hickman slipping back to third albeit only a further 0.7s in arrears. Johnson was holding station in fourth but Hillier had moved up to fifth at the expense of Rutter whilst Gary Johnson was another high profile retirement. Dunlop still led at Ballaugh but only just with Hickman back up to second and only a miniscule 0.178s adrift. Harrison was still very much in contention, one second behind Hickman and Hillier had now got in front of Johnson albeit by 0.047s. Hickman was back ahead by 0.87s as he rounded Ramsey Hairpin with Harrison now 1.7s behind Dunlop whilst the battle for fourth continued to rage, Johnson now back ahead of Hillier by 0.088s! The scene was set for a thrilling final lap and although just 0.5s split leader Hickman and Dunlop, it looked like Harrison was racing for third as he’d slipped almost five seconds behind Dunlop. Hickman added another eight tenths of a second to his lead at Glen Helen only for Dunlop to pull two of those tenths back on the run to Ballaugh. And by Ramsey, Dunlop’s charge continued as he brought the gap down to 0.146s. However, Hickman responded immediately and set a sensational sector time from Ramsey to the Bungalow, the fastest ever, as he did from the Bungalow to Cronk ny Mona and a with a new lap record of 134.403mph, just a fraction outside Harrison’s outright record from Saturday, gave him his maiden TT win. Dunlop was an eventual 4.4s back in second with Harrison in third and Johnson, Hillier and Rutter filling the top six places. Martin Jessopp, Sam West, Ivan Lintin and Todd completed the top ten, West the first privateer to finish. Dunlop (70) extended his lead over Hickman (41) in the Joey Dunlop Championship to 29 points with Hillier in third on 40. West now leads the TT Privateer’s Championship on 58 points. Dean Harrison, Silicone Engineering Kawasaki, RL360º Superstock TT Race. Photos by Stephen Davison / Pacemaker Press Intl.